Staff photo by Steve Muscatello New Ulm’s Molly Scheid tries to get past Laina Berthiaume of Hutchinson during the first period Monday at the New Ulm Civic Center. 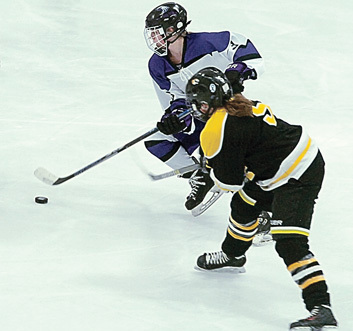 NEW ULM — Playing their fourth game in five days, a tired New Ulm girl’s hockey team saw Hutchinson break a 1-1 tie with four unanswered goals as they skated by New Ulm 5-1 in non-conference hockey. 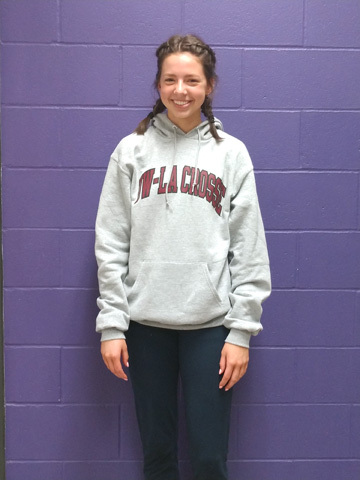 Madeline Gag scored the lone goal for New Ulm, which finishes its regular season at 16-8-1. McKenna Strong and Jayda Helget had the assists. Britta Johnson scored twice for the Tigers (11-9-4). New Ulm goalie Cassie Reed stopped 12 of 17 Hutchinson shots as the Eagles outshot the Tigers 25-17 in the game. The Tigers had taken a 1-0 lead on Johnson’s first goal before Gag knotted the game with a slap shot from just inside the blue line. But the Tigers’ Ellie Campbell got the lead back for Hutchinson less than a minute after Gag’s goal. Johnson followed that two minutes later with a goal and a 3-1 lead after the first period. “They had some tips and deflections that went in and we could not generate enough offense to put some pucks in the net,” Faber said. The Tigers made it 4-1 after the second period at the 10:03 mark and then added a goal in the third period for the 5-1 final. Faber said that she expects to be the fourth seed in the Section 2A tournament and probably host Litchfield in New Ulm’s opening game. “We were the fourth seed last year and won the section,” Faber said.